I met the scientist Dr Jane Goodall when she visited Sydney. I was very impressed with her dedication and the many years she’d spent researching chimps, so I decided to create a book for her. In 2007 I travelled to her chimp orphanage in Ngamba, on Lake Victoria in Uganda. Every day I went into the jungle with the chimps. Often they wanted to ride on my back, but I always had to dissuade them so I could take photographs and write about their behaviour. Chimps are very intelligent and mischievous. They tried to steal my camera and one managed to grab my glasses. Thankfully the guide retrieved them for me. I have a special chimp in my life called Mzee, who was rescued in the Congo by Karl and Kathy Ammann. When he was young we would groom each other and play together. This gave me an insight into his behaviour and the experience was a great privilege. 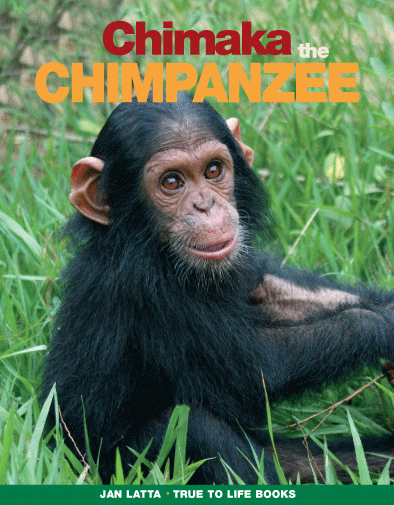 The concept for the book is the chimpanzee talking to children about its life in the wild and how it can survive. There are maps, interesting facts and fun activities.